A friend of mine, and a man who has influenced many IT careers around the world, is retiring. This week, Mark Minasi was at the Microsoft MVP Summit in Bellevue/Redmond to say farewell to many of his friends from across the globe. I’m taking this opportunity to say “thank you”. I’m in a position to be able to write this post partly because of Mark. I’ve written before that 5 years into my IT career I found myself at a point where had to reinvent myself. I realised that relying on my employer to educate me was hopeless. I had to educate myself and put in the extra effort. I learned that continuous learning was the key to continued success. A few years later, in 2003, I landed a dream job, with the opportunity to design a Microsoft infrastructure that would span sites across North America, Europe, and Asia. I had a good idea of what I wanted, but I wanted more information, especially because I had decided to base everything on the just-released Windows Server 2003. I believe in being prepared, so I went to a local book store and picked up two Windows Server 2003 books, including the infamously huge (1800 pages) Mastering Windows Server 2003 by Mark Minasi. I poured over his book for a weekend, pulling the pieces that were relevant and building out a design. A few months later, we went live, and it was gooooood. There’s always Q&A about new things or problems, so I went online to find a place to ask questions. Mark ran a forum at the time and I joined. At first, I asked questions, but over time, that moved from asking questions to answering questions. In 2004, my boss asked how I wanted to spend my training budget. I didn’t want to sit in Microsoft training classes because I knew that stuff. Instead, I wanted deeper information. I found a conference called Windows IT Connections that was running in Lake Las Vegas, and I signed up. There I saw great speakers like Jeremy Moskowitz (I bought his GPO book from him there, and it was amazingly detailed), and Mark Minasi. Mark’s sessions were interesting because he delivered information and entertainment all at once. His consulting work lead to more interesting topics, like understanding how AD replication worked in multi-site environments, the process of password changing, account lockouts, etc. These were all things I had to engineer around, and the information was more than one could find anywhere else. I arrived early for one session, and sat in the fourth row. I was early and minding my own business. Mark came in, got himself set up, and then started to visit with the early birds. He came over to me and said hi. We talked about his one previous visit to Ireland, when he did some training in Galway. I didn’t tell him that I was “joe elway” on his forum – I thought that was being a bit weird. A few years later, the membership on the forum became more and more friendly. The regulars were getting to know each other and chat about non-IT things. Some even knew each other from attending conferences. I don’t remember exactly how it started, but it was decided to arrange a meetup, which evolved into a mini-conference ran in Mark’s home town of Virginia Beach. That mini-conference saw some great minds attend, and share their knowledge. It was here that I got to know Mark personally, and he became a friend and great influence. Mark had a genuine desire to see the attendees excel in all ways, whether it was at their techie job, or in the community as writers, speakers, etc. He freely shared his knowledge and experience. When I think back to that mini-conference and the forum, the collection of people was impressive. One is leading huge Office 365 migration projects around the world. Another is at the tip of the spear on Microsoft’s global push of Azure Stack. A few of them were the best minds in Active Directory, inside or outside of Microsoft. Another was a PowerShell guru, another a Small Business Server genius, and many of them became conference/user group speakers, and eventually became Microsoft MVPs. A few of us discovered that we shared the hobby of photography and we start to go on trips together. We started by doing these trips before/after the conference in Virginia Beach and that became dedicated trips. I started to blog and do presentations. One year, Mark commented on my writing and encourage me to do more. And that became an offer to contribute to his latest Mastering Windows Server book – I was going from reading this series to writing this series! I wrote a number of chapters and my name was in the cover. That was a wow moment in my career. 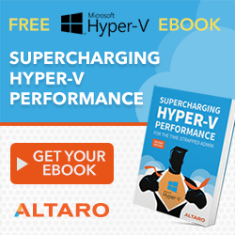 From that came other offers, and then I went to being the lead author on a few books, including the two Hyper-V books. Mark’s advice on writing was to assume nothing about the reader. Explain the subject at a high level, introduce it, add some advanced content, and then cover the monitoring & troubleshooting. That’s the approach that was used in the Master series of books, and it’s something I adopted for my writing style. My writing eventually lead to an offer to write for Petri.com. The editor back then came from Windows IT Connections (it’s a small world) and he wanted me to use my style or writing to explain Microsoft’s often confusing messaging in the Hyper-V and Windows Server context, and that migrated into Azure subject matter. The offers for speaking kept coming, and Mark was always offering advice. He thought I should speak at, what was then, TechEd. There’s a longer story, but I eventually did get into TechEd Europe and the first Microsoft Ignite and, thanks to Mark’s advice over the years, I got great scores. I’ve spoken at many events and webinars. At work, I found myself writing and delivering larger and more complex training, eventually becoming 1-, 2-, and 3-day courses. For years, Mark has been telling me to start doing my own thing. He reckoned that I should have been travelling Europe and the US, teaching Hyper-V classes. I didn’t really have the confidence that I could make that work but he always told me that I was silly to lack the required confidence. He was certain that people would attend. Last year, my wife said the same thing. 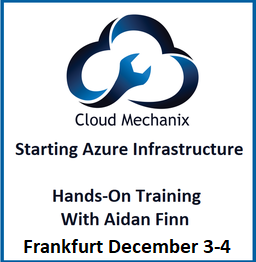 Last year, I started Cloud Mechanix, and last month I taught my first Azure training course to a full room in London. Next month, I teach my second class in Amsterdam. Mark’s influence on me changed my career. He’s always been a supporter, and encouraged me to do more. I know I’m not alone in that either. What he’s done for me lead to me asking him to be one of my groomsmen when I got married and I was honoured when he said yes. That’s just my story. I’m certain that probably dozens of other people have similar stories of how Mark Minasi has impacted them. Mark has attended the Microsoft MVP Summit this week to say farewell to many friends because he has retired. I’ve seen some of that – people are coming up to say “hi” and “thank you”. I don’t think he can walk down a hallway without someone stopping him – it’s a nod to his impact on so many of us working with Microsoft products. Mark, if you ever read this, thank you on behalf of me and the many that you have helped or influenced at your classes, the events you have spoken at, or via the books and articles you have written over the last 4 decades. yes, I’ve called the 2003 book the bible to my desciples and I still use it to teach newlings the basics of dns and tcp. Great to hear he had such an influence on you and I’m sure he had the same influence on loads of (less known) people.